We’re excited to announce a new third-person action shooter called #killallzombies, coming to PS4 first. In the distant future, #killallzombies is thrusting civilians into a sport of survival where a ravenous zombie population is unleashed in the name of sports entertainment, with television spectators voting upon how many zombies they want to uncage to make survival all the more difficult for you to accomplish — with the potential of a collective horde of more than 1,000 zombies. The arena is comprised of hundreds of hexagonal tiles that are capable of totally changing the dynamics of the gameplay by altering the landscape. 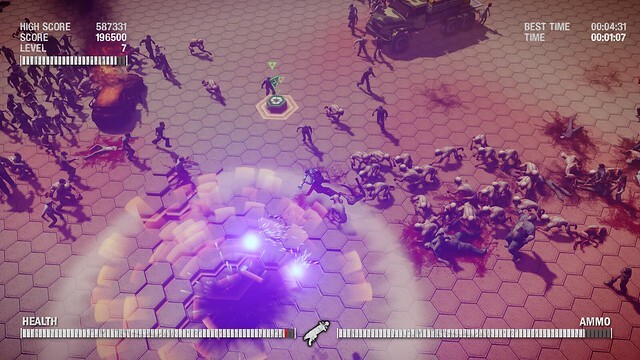 For example, spawning new obstacles, such as various cars and knives and others; hexagons that cave in on themselves to create dangerous traps; hexagons that rise from the ground to create a blockade that may keep some zombies out, but also keep the player in. And there are many more ever-changing gameplay dynamics. Social interactivity is a hugely important feature for #killallzombies as we want to deliver the most engaging, socially interactive and fun game in the third-person shooter genre. 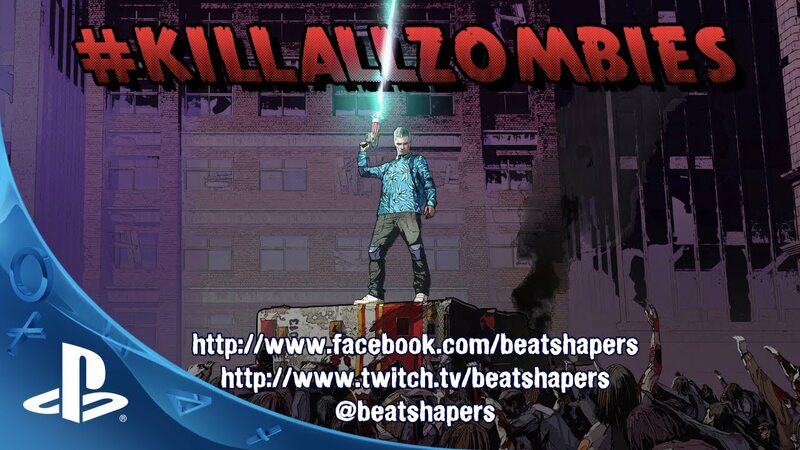 A central attribute to the social interactivity is involving stream viewers into core gameplay elements via chat and voting mechanics, which allows for people to not only spectate, but also participate during a player’s live broadcasting of #killallzombies via PS4 and Twitch. Every 80 seconds, viewers have a choice of two encounter options available to vote on, including encounter spawns, various arena events, timed bonuses, and perks. The perk select screen has its own voting mechanic in which if the player decides to wait and select the spectator’s most voted perk, the player will be offered additional XP and Health. The chat commands are available throughout the broadcast as we are executing chat commands in real time, allowing the spectators to affect on a variety of imperative decisions that can significantly increase or decrease your chance of survival — such as increasing or decreasing your character’s speed or health, spawning more or less enemies, etc. For the most evil of spectators, there’s the opportunity to deliberately change the camera angle to a less effective perspective and reverse the entire control scheme, and much more! To avoid spam, some commands have their own cool down mechanic. Some of them can be triggered with different keyword commands with some lasting until the session ends. There will also be plenty of hidden commands that you will have to figure out for yourself along the way during gameplay, and we’ll be posting special announcements online. There’s plenty of weaponry available at launch, like the Beretta, Revolver, Sawed-off shotgun, M-16, M-60 and a futuristic X-Bow and Plasma Gun, alongside various bullet types including normal bullets, armor-piercing rounds (that are capable of shooting directly through zombies), and freezing bullets. The control scheme consists of your typical twin-stick shooter with the left analog stick moving the character and the right analog stick shooting in the appropriate direction. 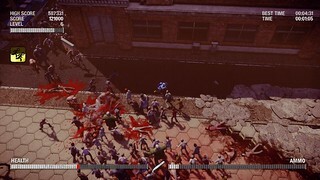 The player will fight through various categories of zombies, such as slow, fast, jumping, gigantic, and enraged bosses. Killing significant quantities of zombies will earn XP, which will eventually enable the player to level up, which is a very important process as it provides the player with a choice of perks that will be incredibly helpful in surviving the hordes of zombies. 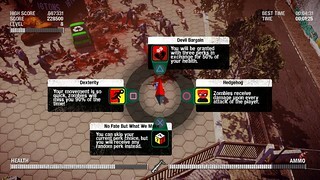 The perks have a tremendous power to each of them that can shift the balance of power from the hordes of zombies surrounding you to the player, as the perks range from invisibility to insta-death, which sensationally leaves absolutely every zombie in a crumpled heap on the ground. Will you have the survival instincts to endure the Arena? We expect it next month but depends on QA. I can’t wait for this! Looks fun! This sounds like an excitingly fresh take on arena combat. I’m in! I am impressed and now have my eye’s on #killallzombies. I love the name! HAHA! The whole social aspect could be truly fun with many awesome moments arriving from the changes. Very happy to hear about the different types of zombies and ENRAGED BOSSES! YES! Since everyone will be asking you shortly I will save them the time. Any chance of a Vita release? Also, what is the release date? Thanks for your hard work! But we thought about PS3 version, will see. Wow. This looks AWESOME! Love these types of games. Though, I’m not really a big fan of those streaming commands and such, but it’s still a cool feature. Any plans on a platinum trophy? That’s be sweet! We planning add co-op modes post launch, thinking on best mode for this genre. Looks fun. Wish it was on Vita though, even if you had to scale it down to say just 500 zombies at any given time. This is not a 3rd-person shooting game. It’s top-down shooting like dead nation. Looks fun! I’ll take a look when it comes out. Any ideas on the price point? Not yet announced but at launch. I do not wish to seem mean, as I’m sure you put your time and energy into making this the best game you could, but what possessed you to do a zombie twin stick shooter over a brown/gray setting? That’s like the trifecta of played out. Developers need to get off the zombie thing. If you need hordes, get creative. Robots, monsters, slimes, animals, beasts, whatever. Seriously I feel like some iteration of this game has been made a near-infinite amount of times. I’m going to pass, but I wish you all the best and hope you take your talents to some place more creative in your future endeavors. It’s dead nation without multiplayer? Looking good guys. But you should really think about adding 1 screen 4 player couch coop. But, the price will be the final deciding factor for me. Keep up the good work. Best of luck with this game. a zombie dual stick shooter. meh. This will be a great game and with the features for the PS4 version this is just brilliant and besides slaying zombies is just a blast!!!!!!!!!! I hate the name. Why are you pushing so hard for people to tweet the name of it? Ugh. One thing in the post that bothers me is you said the weapons available at launch. I dont want dlc weapons. Nobody wants to pay for that. Not a fan of watching others play, and dont want people screwing up my game. Also, the number symbol before the title is so played put. Its not funny or clever. Driveclub dropped it, you should too as nobody will ever pronounce it the way you wrote it. We dont plan DLC weapons, we just add them to game as more zombies bosses and game modes. So what’s to stop random people from being malicious when sending commands to your game? Have you never been on the internet before? I don’t understand the need for all this social connectivity in a single player game. Why on earth would anyone want random people messing with their game? Have you seen current streaming channels? There arefew games with interactions and random people actually voting. If you know cool command why not send it to stream to scare streamer? Hashtag is not twitter invention but they used it widly indeed. looks amazing ! its like a copy of crimsonland…..ok, i wanna play crimsonland now u.u, waiting for news ! Can we get ANY twin stick shooters with some replay value? Strategy, Tactics, Upgrades/Skills with variance other than a BFG. Passed to designers. Good points. Twin stick shooter? Yawn. I expect something new and exciting from indies. Not a retread on an extremely worn out genre. We never claimed we are indie. Looks real interesting. Will the soundtrack be anything like the song that’s playing in the trailer? Thank you for the reply Mr.Menshikov. I do not post these blogs to be mean to hard working developers. that there is so much learned from each, that more could be expected. I have noticed that those types of games, always keep me coming back, and usually buying them more than once. One like that, would be worth the first day retail price tag. Either way, good luck with your future endeavors, as gaming has definately improved in alot of ways, although, I loved the simplicity of games like Mario, Master Blaster, and Castlevania. If more devlopers had more time, or if copyrights did not stand in the way, I am sure I would be amazed. I would love to play more games like this where people watching can affect the outcome. Its definitely where we need to be to be more social and engaging with other players. While I really enjoy the genre of games (Crimsonland is probably my all time favorite top down version of this back from when it was an early release on PC but the RE5/6 Mercs modes take the cake in terms of survival and replayability) I have to agree with another commentator. What’s to keep me coming back to this game? Crimsonland simply had a laundry list of perks, weapons and different ways the game could end up going to keep me coming back and the Resident Evil games had that Strategy and tactic that was mentioned before. There were mechanics at work that required you to pay attention to go for that high score. It felt like it mattered. I don’t really think that’s an easy goal to accomplish without setting those mechanics in early in the game. Else it will feel tacked on like in other games of the genre. So I ask you, what does this game offer to give the same replay value that Crimsonland and RE5/6 The Mercenaries gave? The spectator options are a good idea, but you have to consider that people generally aren’t going to watch EVERY STREAM. if you sell 40,000 units and have 20,000 streams..you’re going to have some people left out. Reminds me of Robotron 2084 with zombies… if it’s fastpaced and ‘arcadey’ this could be a blast.